I have been very behind on my sewing lately. Since August I have completed maybe one or two makes and one of them was for my boyfriends mum! I bought a house in August ( our first home purchase) and we have completely gutted and are in the process of renovating the whole house. As you can image sewing has unfortunately taken a little backseat. Taking a sewing break has actually been a blessing in disguise. Not only has it made me realise I buy WAY too much fabric, but I am also making clothes that no longer suit my wardrobe. Like most people, I am a sucker for pretty dresses, which in all honesty do not fit my style on a daily basis. Therefore my plans for Make Nine in 2019 will be mainly focussed around the fabric and patterns I already have as aswell as clear gaps that are in my wardrobe. My Make Nine list may be a little on the boring side this year, however, I am hoping that this post will allow me to fully think about how I can use my fabric stash and create a stylish, yet practical wardrobe. I wear a lot of shirts at work, and I love the relaxed look of this pattern and the cute detail to the back of it. It was actually a toss-up between the Rachel shirt and the Granville Shirt by Sewaholic Patterns. If the pattern does not work out, I will try the Granville one. However, I am hoping the shirt will fit right into my work wardrobe and I want to make it in a number of different fabrics. Fabric Stash busting: I have already cut out the shirt in a lovely stripy blue shirting fabric, so watch this space! Once again Sewaholic patterns came in a close second with the Cressida Skirt. I absolutely love how the Cressida skirt has the button placket down the centre front as well as belt loops. The pattern looks stunning and I am sure it will flatter my body shape well. As it is still cold over here in the UK, I want to make the skirt out of woolen suiting fabric, which I am hoping will fit right into my wardrobe. I know I said earlier that I have too many pretty dresses in my wardrobe right now, but I just couldn’t refuse this one! I absolutely love the gathers at the front and the neckline of this dress. This has been on my list for quite a while and I kept putting it off as I have seen some bad reviews of this pattern. I am hoping to reduce the bulk at the waistline to create a more slender silhouette. The Camille Trousers have been on my wishlist ever since the ebook came out! I fell in love with the high waisted style of them and I think they would be perfect for workwear. I am a big fan of high waisted and wide legged trousers, every since I bought a pair of RTW trousers from HOBBS I have been on the lookout for a similar pattern. I have already made a toil for this pattern as it will be the first every pair of trousers I will make! I am still nervous about it so I have cut out another wearable toil just in case! The Lacey dress is the perfect loose-fitting woven dress for days when you just don’t know what to wear. Last year I noticed that I am missing stylish, yet casual clothes that I can “chuck” on when I am in a rush. I want my clothes to work across my workwear and casual wardrobe and I think the Lacey dress is just the ticket! I made the Carolyn Pyjamas for my boyfriend’s mum over Christmas, which turned out great! I particularly liked the piping and the pockets. The instructions were great and the fit was fantastic! 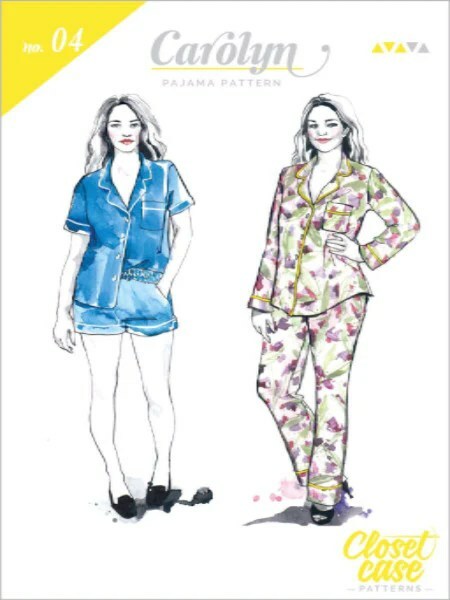 Therefore I couldn’t help but put the Carolyn Pyjamas on my MakeNine list this year. I aim to make the summer short version as I have too many winter pyjamas already! I have made the Moneta Dress by Colette Patterns quite a few times now and I have loved every single one of them. The dress is great for times when you just don’t know what to wear and I love the fact it works for work as well. However recently I have fallen out of love with the pattern, I think it might have been a case of a pattern overkill for me. Therefore I wanted to find a pattern that is similar in terms of knit but has that extra bit to it. I think the Gable Dress is the one. Usually, I can’t help but fall in love with Jennifer Lauren Handmade’s pattern as her illustrations are beautiful, but the Gable dress has really stood out for me. I love the neckline, I just need to find the perfect fabric for it. As a result, I think this will be a latter make in the year as I want to focus on using up my stash, which consists mainly of woven fabric. I know I have too many summer tops in my wardrobe, however, I have been dying to try out this pattern for quite some time. I love the trapeze style of the top and think it will be very flattering with some chino trousers during the warmer months. I may pull in some of the ease as I think it can maybe look to tent-like, but we will see. I have some lovely gingham fabric this will be perfect for! The Penny dress has been cut out from my fabric stash for over a year now! I had big plans for this dress last year, but it got pushed to the back of my mind when we bought the house. I am hoping to dig it out and sew up a lovely dress in time for spring. The fabric is a beautiful navy polka-dot crepe I have been hoarding for quite some time! So that’s it for Make Nine 2019! What do you think of my choices? I was invited to an old school friends wedding reception this month, and I wanted to wear something pretty but not too formal. The Grace dress sprang to mind straight away. I got the pattern free with a copy of Love Sewing magazine and loved the lace overlay version of it. I also wanted to use up the fabric that I have been hoarding away in my stash. Luckily I bought some black lace back during my holiday to the Somerset last summer from Fabric Land, Bristol. The fabric was around £4.99 a meter. I bought 2 meters of it and never had any idea what I could make with it! As it was my first time working with lace, I wanted to use a pattern which I had made before and had a simple construction. The pattern itself has a gathered skirt, lined bodice, and a waistband. I first made the dress last summer out of a cotton liberty print poplin, where I fully lined the whole dress. Although the dress fits quite well, it gapes a bit around the shoulders and armhole. Therefore with the lace version, I decided to attempt to do a full bust adjustment (FBA), which I had never done before! I used a variety of books and websites to help with my FBA, and I think the fit turned out perfect, however, I don’t know if it was more luck than skill! With the liberty print dress, I cut out a size 12, based on my full bust measurement. However with the lace dress I cut out a size 10 (based on my high bust measurement) and graded back out to a size 12 at the waist, otherwise, I wouldn’t be able to breathe! I think the lace dress has a much better fit around the waist and bodice, and I feel like it looks a lot more flattering, especially for evening occasions. The lining of the dress is a mixture of some scrap black fabric for the bodice and some cream peachskin fabric for the skirt. I bought both fabrics from The fabric Room. The black fabric is called “Flippa”, it was £3 pm, the black is now out of stock, however, you can get other colours here. The cream fabric is a gorgeous and drapey peachskin which can be found here, and best of all it is only £2 pm! I highly recommend the Fabric Room for great plain fabrics, however, the catch is you have to order a minimum of 3 meters. As the lace had a fair amount of stretch to it, I struggled at times to match up the lining bodice and skirt. However, once everything was in place I just topstitched the top and bottom part of the bodice in place. This also helped me at a later stage when I was inserting the invisible zip. I deliberated for ages wondering if I should show you the HUGE mess at the back, however, I want to document my mistakes as well as my achievements! You will also notice that the back is a lot deeper than the pattern, I decided to lower the back to give it more of an evening look. I love the neckline and back of the dress. Just a shame about the train wreck of the zip! We live and learn! Overall I am pretty happy with the dress. I love how it fits my body much more than the liberty print dress and I adore the little lace detail at the bottom. Although there were a few hiccups along the way and the elephant in the room is that horrid zip! I really enjoyed wearing it and felt great given the time constraints that I had. I am sure you can all agree that sewing brings many joys in life, but when one thing goes wrong, it can be one of the hardest and most frustrating things to fix! My sister is going to a wedding in May and asked me to make her a dress for the occasion. She complains that RTW clothes don’t fit her properly – so she wanted a dress that fits the bill. After trawling through many patterns, we finally decided on the Charlotte Dress by Sew Over It (which is ironically my sisters name!). The dress is a PDF only pattern, which I am not a huge fan off, as they take such a long time to tape together. I also wanted to try another Sew Over It pattern as I was quite disappointed with the 1940’s Tea Dress pattern (which I will post about soon). 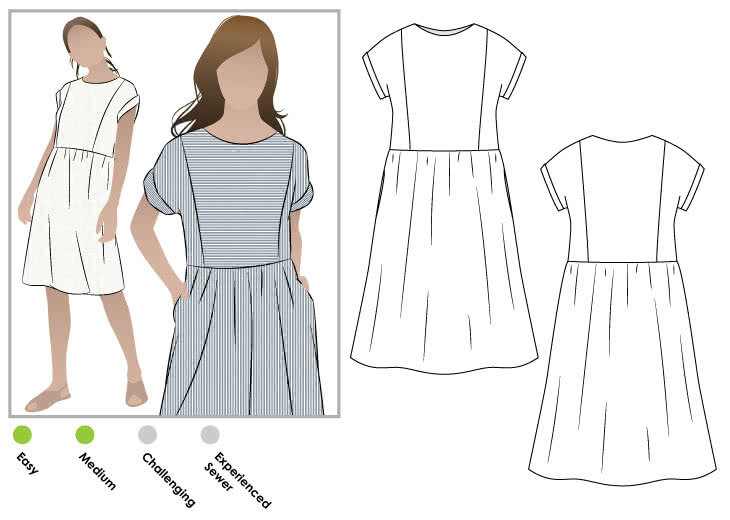 According to the website, the Charlotte Dress is aimed at intermediate sewists. It has a number of features including kimono sleeves, lapels, pleats and facings. The pattern calls for a medium weight woven fabric with plenty of drape and recommends crepe or viscose linen. My sister wanted a more structured dress which held the pleats well and therefore we opted for a cotton poplin. The material I used for the dress was a blue leaf pattern cotton poplin. I brought the fabric from a stall at the Spring Knitting and Stitching Show in London, it was £6 pm. You can get the same fabric in different colours from here (at £7.99 pm). I brought and used 4 metres. The pattern is not lined. It has facings for the front and back and a self lined waistband. As the fabric was slightly sheer, I wanted to fully line the dress. This also gave it some much-needed weight. I used the same fabric to line the bodice and some white sheeting from John Lewis to line the skirt. I was a little disappointed that I ran out of material to line the skirt, however I actually quite like the contrast between the pattern and plain white fabric for the lining. I ended up grading down the pattern by two sizes. This is because my sister wanted to have a much tighter fit on the dress – especially at the waist. As the waist does not have much ease, we decided to omit the tie waist. This ended up creating a much sleeker silhouette. However, If I was to make it in a softer fabric such as crepe I would definitely add a tie to the waist. The instructions were very good and well laid out. The fact I didn’t have to insert any sleeves! I had to reduce the shoulder seams by an inch and reduce the back neckline by an inch. School is still being quite hectic and I am struggling to get much sewing done in my spare time. I would like to dedicate one full day of sewing this weekend, however I have open day at my school so I doubt that will happen! During the summer holidays I stumbled across a post from Simple Sewing Magazine on Facebook. The post was from the pattern company Jennifer Lauren Handmade and that they were looking for pattern testers. I jumped at the chance and quickly signed myself up. whilst I wasnt succesful to be picked as the first pattern tester, I was picked to test the Afternoon Blouse and Shift Dress, which you can find here. There is no ignoring the fact that Jennifer Lauren Handmade has produced some absolutely gorgeous patterns, I particularly like the look of the Laneway Dress. However, I can’t say I was a huge fan of the Afternoon Blouse and Shift Dress, at first I thought it might look a little dull and plain-looking, which isn’t my style at all. Although the pattern sketches are gorgeous, I wasnt a fan of the simplicity of the dress. When I first moved back to Kent, I decided to enrol in another sewing course. The course worked really well with work as it was on Wednesday evenings for two hours over a ten week period. Our course tutor asked us all to bring in a pattern to work on. As I was the only one out of our group that had a little dressmaking experience I decided to challenge myself. Enter the McCall’s M7084…..